Then there is Captain Steve with his favorite healthy (?) groceries! At least most of it is dark chocolate! 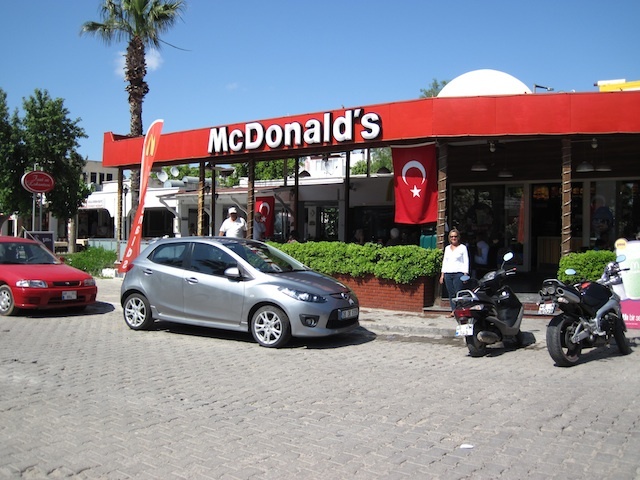 When we get tired of Turkish cuisine we stop by the local hamburger place - McDonalds in Turgutreis, Turkey! - When the wind and waves rage around Aspen, Admiral Maria likes to watch the movie The Devil Wears Prada while Captain Steve sits outside in the cockpit and worries about the weather. 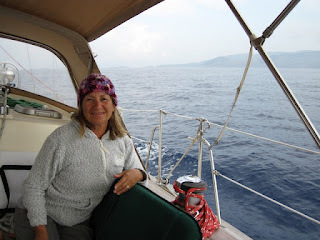 - On calm days at sea Admiral Maria enjoys reading a new book. Captain Steve sits outside in the cockpit reading repair manuals about how to fix what is currently broken on Aspen. 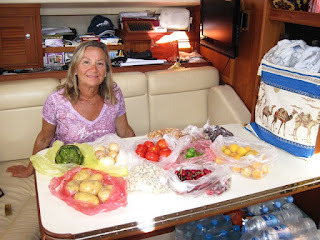 - Once we make landfall in a new country Admiral Maria finds the local market and browses the strange fruits and vegetables, searching for just the right combination for dinner. Captain Steve waits in endless lines for custom, immigration and port authorities to check Aspen and her crew into the country so they can stay and he can fix things on the boat. 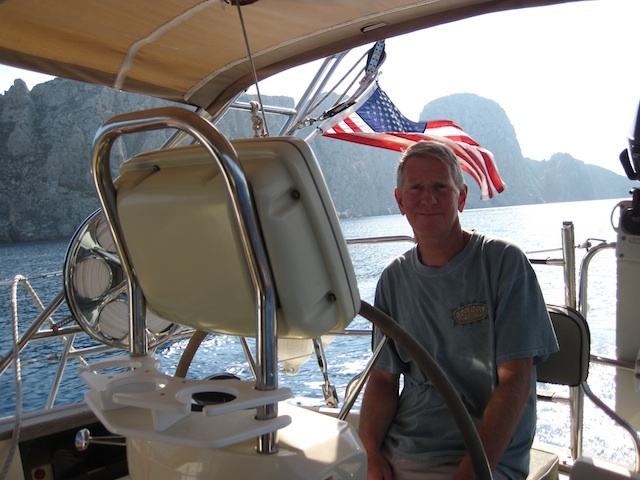 - Admiral Maria forbids anyone from coming near her galley while Captain Steve stands guard over Aspen’s engine and other critical parts, avoiding the galley of course. - Anchoring is Admiral Maria’s responsibility: dropping the anchor, retrieving the anchor, securing the anchor, fishing mooring lines out of the water and dealing with the marina tenders who ask her all sorts of questions as Aspen is preparing to tie up to a dock. Captain Steve sits at the helm looking important and trying not to crash Aspen into the dock or go aground. - Admiral Maria eats healthy (she likes to graze), cooks healthy and exercises regularly to maintain her fitness and mental health. 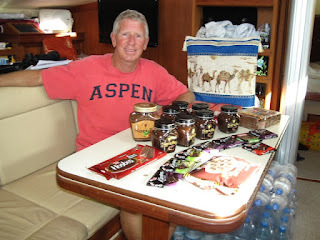 Captain Steve runs way too much and as you can see from the attached pictures, eats less than a wholesome diet! 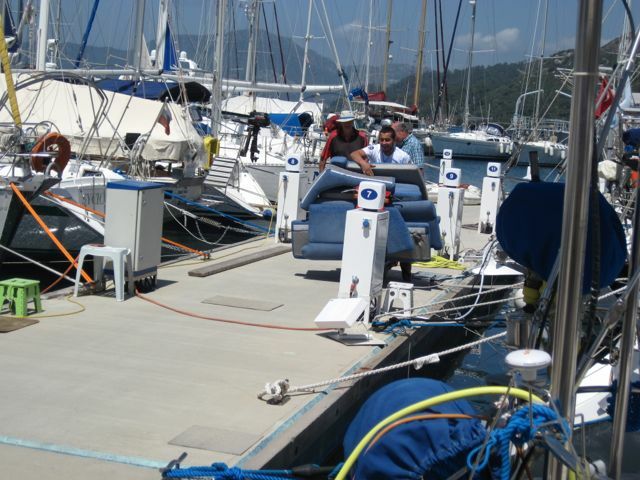 This is a typical dock in Turkey where we tie up stern-to. 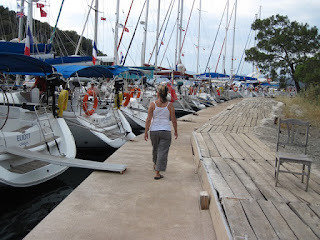 Maria is looking at the nice planks the boats have. On Aspen we just jump to the dock since we don't have a plank! Kapi Creek dock. Aspen is the cream colored boat in the middle with the shortest mast. 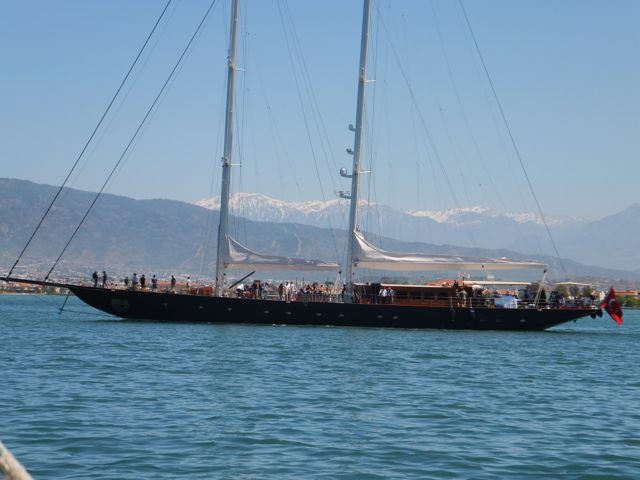 The other boats are all charter boats and they tend to be much larger to carry all of the beer for the sailors. 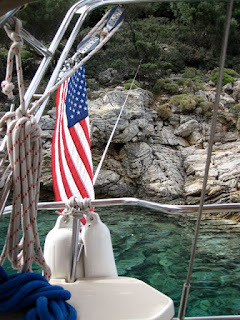 Sailing near Knidos, Turkey. Captain Steve is a little worried because we are about to round the famous Cape that trapped St. Paul. Aspen didn't have any problems with it though. 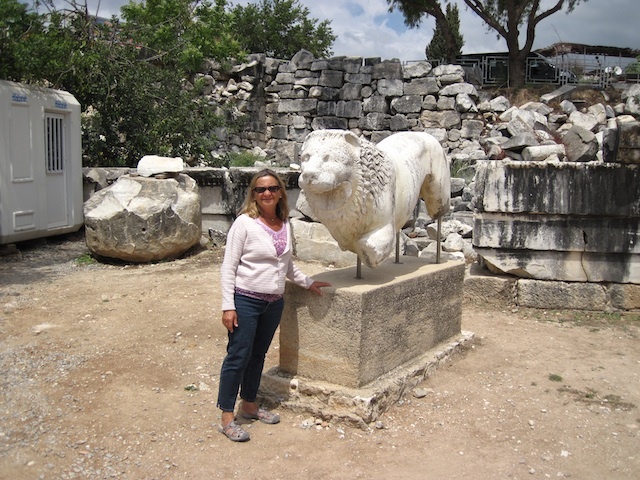 Maria next to the famous Lion at the Temple of Zeus in Turkey. Another famous face - no, not the Admirals face but that of Medusa! 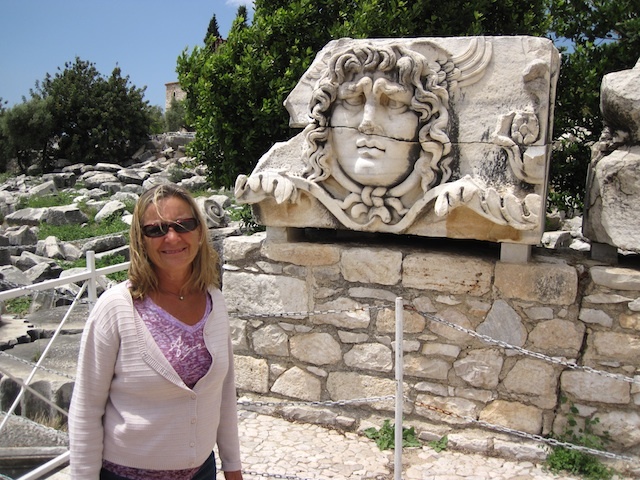 Where is the warm weather in the Mediterranean??? 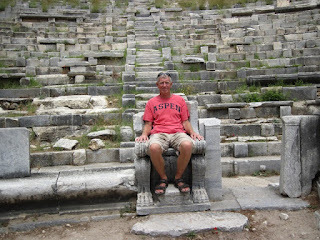 Ah yes, a seat fit for a king at the Theater. 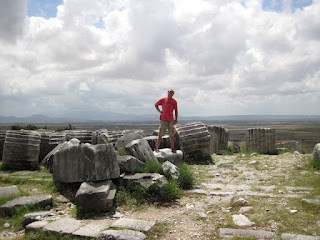 Or did it belong to a gladiator who didn't win his battle? 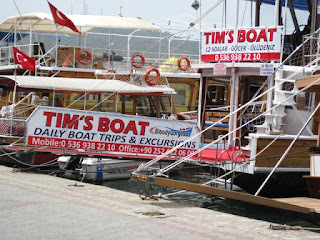 Nice name for a boat (stolen from our grandson, Timothy we are certain)! The transmission has gone missing. This is all that is left after it was taken away. 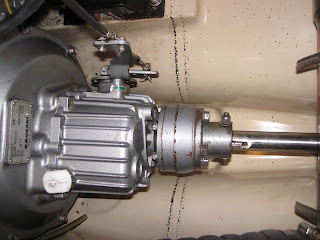 The repaired transmission is back in place. But the black streaks are oil that leaked from it once it was put back in. They just forgot to tighten the bolts it seems...! Aspen's current marina at Turgutreis is in the background behind us. 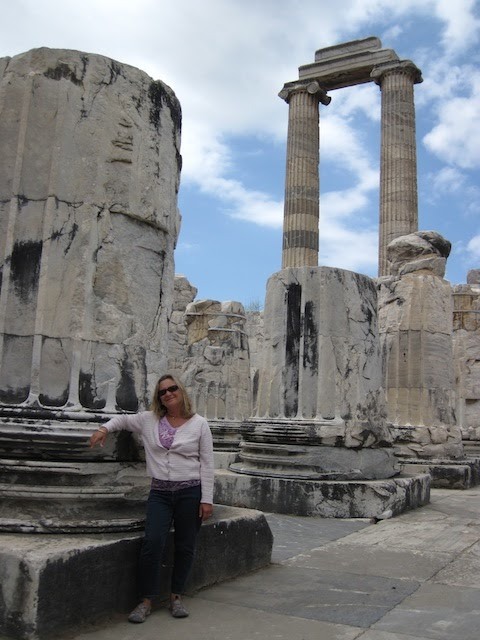 Now that is a big column at the Temple of Zeus! 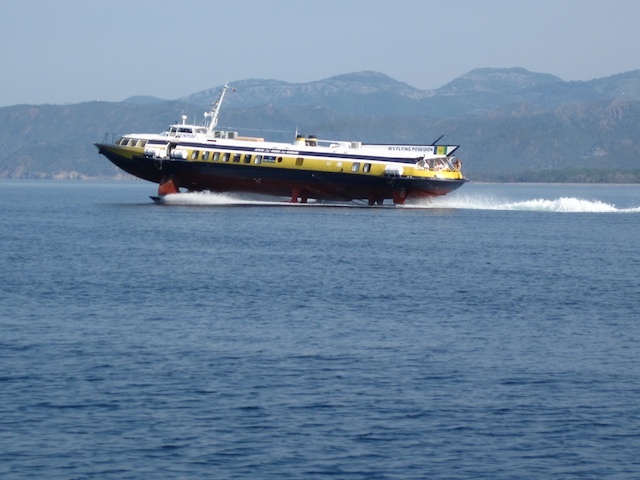 Hydrofoil heading from Fethiye, Turkey to Rhodes, Greece. They will be there in 50 minutes. It would take us 12 hours to get there! The transmission is fixed! 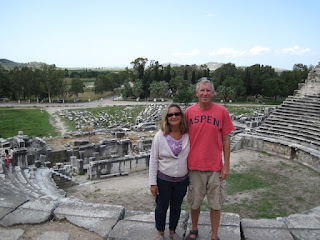 That only took 8 days to repair it in Fethiye but at least we were at a marina so waiting was not painful at all. In fact there was something new happening every day. 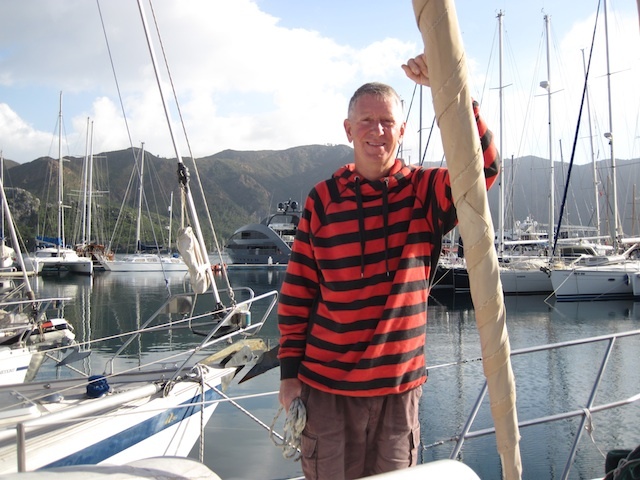 We were berthed where all of the charter boats come in to stay for the night and watching their antics was very entertaining. The best people to watch are the Russians. 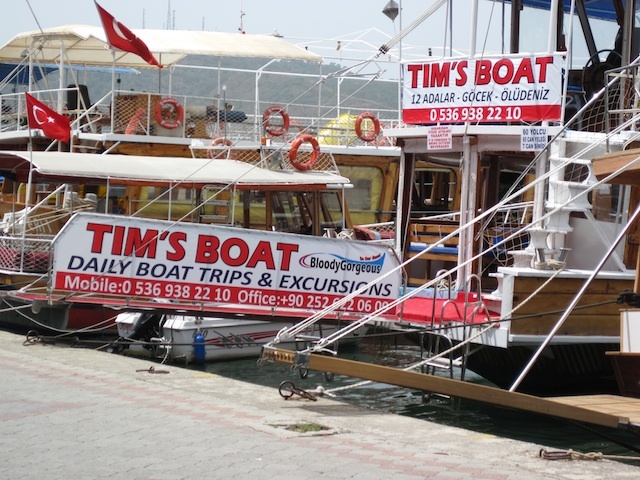 The Russians have discovered that they can now travel outside of their country so they are coming to Turkey and some of them charter boats for their holidays. There must not be a lot of sailing in Russia because they have a hard time with the concept of forward and reverse and even getting tied to a dock. One group on a nice charter boat decided to leave the dock under full power but just forgot to untie one last dock line. 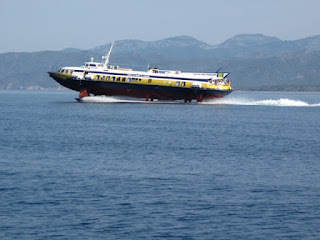 The boat came to a screeching halt, nearly throwing the 3 people into the water when the line stretched tight. 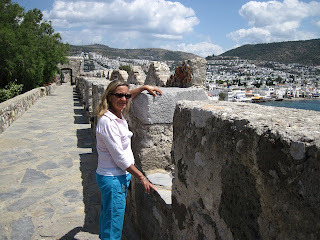 Of course this was just after lunch where the crew consumed mass quantities of vodka. And to think that they just threw the line off the boat and continued on their way in the condition there were. It is scary out at sea! 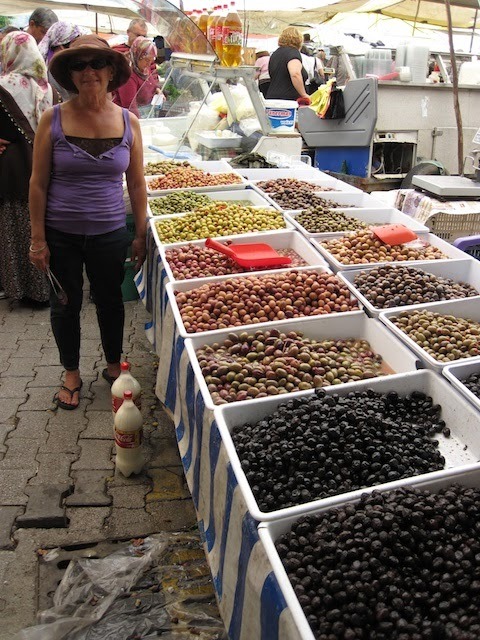 There is a weekly market in Fethiye too. 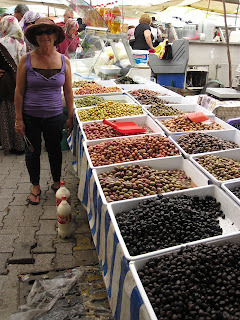 It seems that people come from miles around to sell their wares, fruits and vegetables. Their wares consist of counterfeit clothes, jewelry, name brand women’s bags, shoes, DVD’s etc. Everything you can think of is sold at this market and at very cheap prices, if you bargain hard for what you want. Bargaining is required in Turkey! Maria got an exact copy of a Longchamps handbag for next to nothing. Then she got several new wardrobes of blouses and pants for the same low prices. Captain Steve does the bargaining because women don’t usually bargain in Turkey – it is still very much a man’s world here. Arrrrrrr says Admiral Maria! We also bought some very new DVD’s including the new Avengers movie, Sherlock Holmes, Ghost Rider, Iron Lady, etc. for next to nothing. Of course these are all filmed with illegal cameras in movie theaters so we get the subtitles and audience reactions on the DVD’s as well! Aspen finally left the marina with our repaired transmission and sailed northward exploring the 12 Island Bay including Kapi Creek and the nice bays in that area. This area is fairly small but with a lot of places you can tie up to a dock for the night. 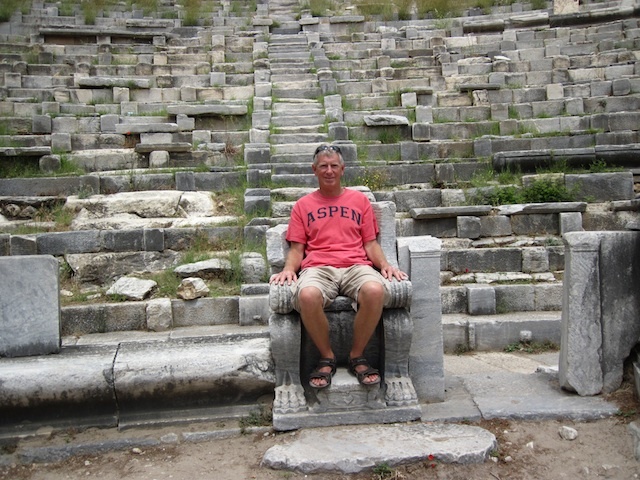 Things tend to be very civilized in Turkey when you want to stop for the night. 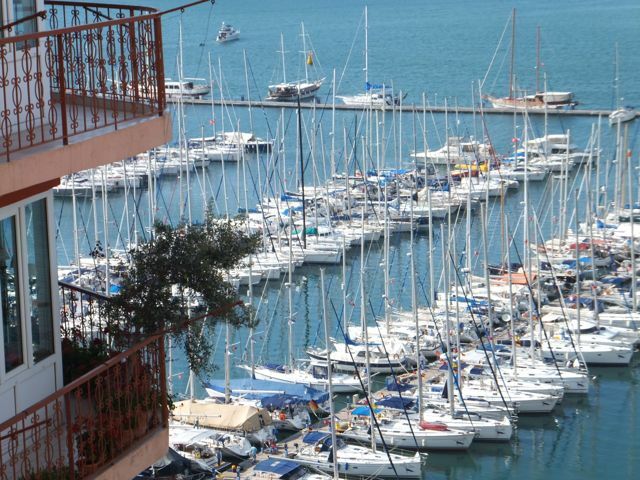 A lot of bays have docks where you stay. The procedure for docking is much different than in the USA. 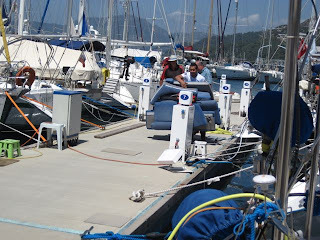 Here in Turkey you are shown a line by the dock owner that is attached (hopefully) to a chain on the sea bottom close to the dock. This is Admiral Maria’s job – fish the line out of the water with a boat hook and quickly secures this line to Aspen’s bow. Maria has to calculate exactly how much length of line needs to be out so that Aspen can back up to the dock but doesn’t actually crash into the dock. Captain Steve then expertly (?) backs Aspen up, stern to the dock. If everything is done correctly Aspen’s stern is positioned about 1 foot away from the dock so that everyone can easily walk off to get to terra firma. There are a few problems with this procedure as you might guess. First, the line that Maria pulls up is usually either too heavy for her or encrusted with barnacles that are not safe to touch. Secondly, the amount of line to be secured to Aspen is always a guess because Maria can’t easily see where Aspen’s stern is relative to the dock. Thirdly, and Captain Steve thinks most importantly, Aspen doesn’t like to go in a straight line when she is going backward. Aspen does what she wants to do and when in reverse: figure 8’s, curves, spins or just about any direction except straight is where she wants to go. Eventually we figure it all out and we are secured for the night at the dock. Of course at the head of every dock is a restaurant where you can buy a nice expensive meal to pay for your dockage fee for the night. Isn’t that just civilized! The meals are usually pretty good and the price of admission allows us to be secure and we are able to explore the ruins and trails in the immediate area. 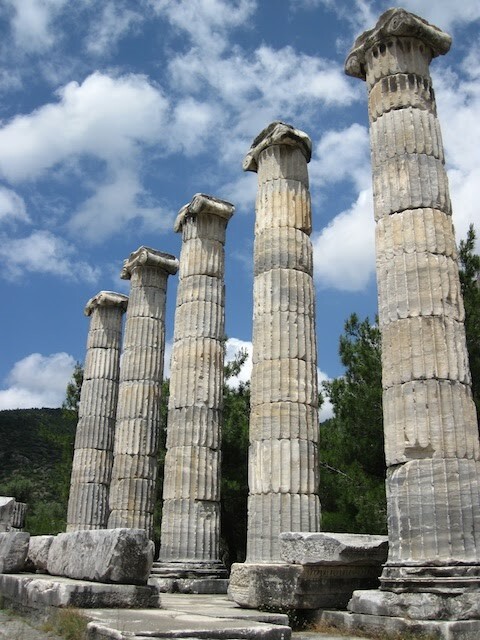 For the past 2 weeks we have explored the 12 Island Bay, the Ali Baba bay and the fascinating ancient seaport ruins of Knidos, our favorite place. Knidos is right at the cape before entering a huge bay near Bodrum. 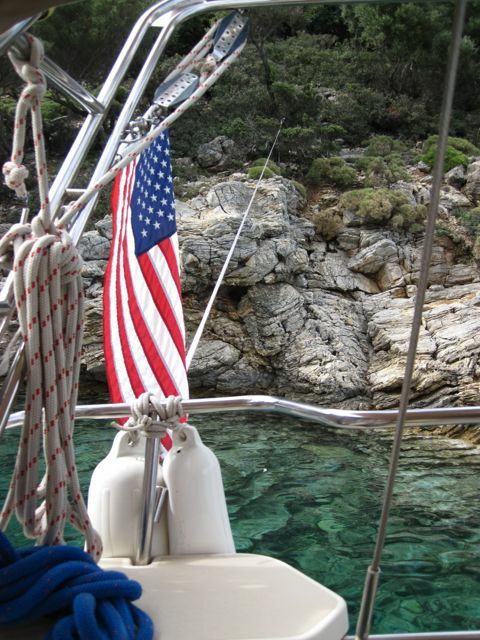 Sailing ships from ancient times used Knidos Bay to wait for favorable weather in order to round this nasty cape. Even when the Romans were bringing Paul (yes, The Paul) to Rome for trial they had to stay here and wait for weather. 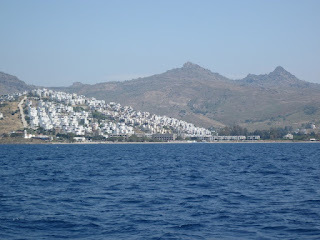 Once past Knidos we sailed to a marina at Turgutreis that is ultra modern. 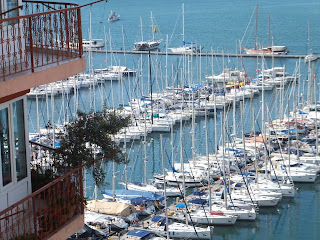 There are 500 boats in this new marina and the facilities are better than anywhere we have seen. 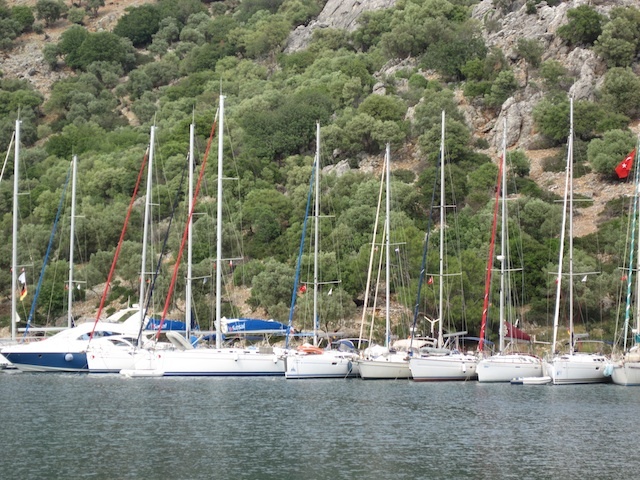 The Turks build the best marinas. 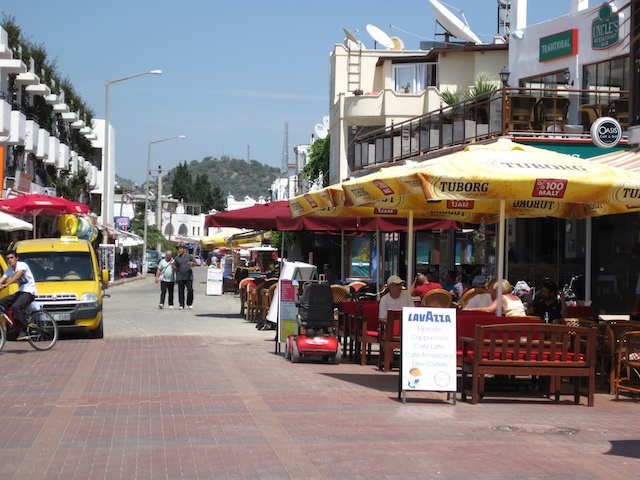 We were able to get a berth in the marina where we are now and enjoy the little town of Turgutreis where guess what? They have a McDonalds! We are easy to please. 6 miles across the channel to the west of us is Greece, our destination for the middle of next week. We have to get out of Turkey because our visa expires here and the closest place to sail to is Greece. So Greece it is! Along the Lycian Way in Turkey. 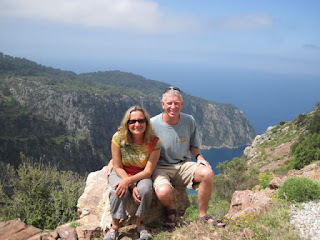 Below us is Butterfly Valley on the Aegean Sea. This is how we look to people passing by on the docks at the marinas where we stay. A Hamam or Turkish bath. We lay on a hot marble slab and this guy scrubs us with hot water and soap bubbles. How much can you load on a scooter and drive down a marina dock? 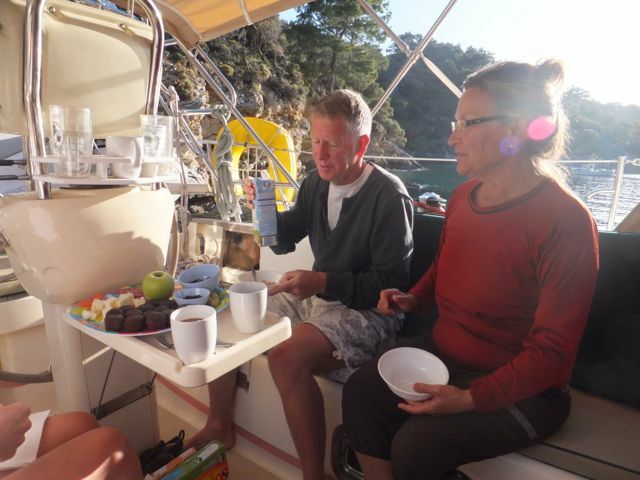 Just a typical breakfast at anchor in Turkey! We took a fast ferry to Rhodes, Greece for the day with our friends Tim and Deb. It was a pretty rough ride and just about everyone on the ferry used little white bags (but not captain Steve of course!). 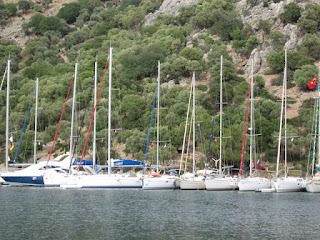 This is our marina in Fethiye, Turkey. 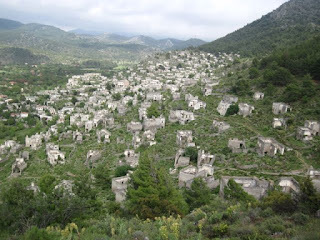 In 1923 Turkey decided to repopulate the Greeks in this village and pretty much everywhere in Turkey back to Greece. The once flourishing town became a ghost town and no one lives here now, even though the setting is spectacular. 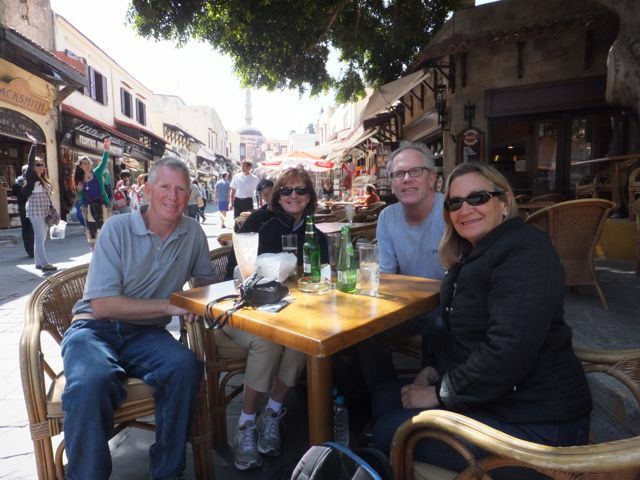 This is a little cafe in the old section of Rhodes with our friends Tim and Deb. As per many (?) requests, Captain Steve's new haircut! The James Bond movie Skyfall was filmed onboard this magnificent yacht in Fethiye, Turkey. I think you can just see Daniel Craig (who resembles Captain Steve we have been told). Typical vista along the Lycian Way in Turkey. We managed to drive quite a ways on the trail that is actually a jeep road in places. Maria getting a nice mud bath in the thermal hot springs near Dalyan, Turkey. Maria found her oregano in Rhodes, Greece!!! Just a nice bay on the way down the Turquoise coast of Turkey. 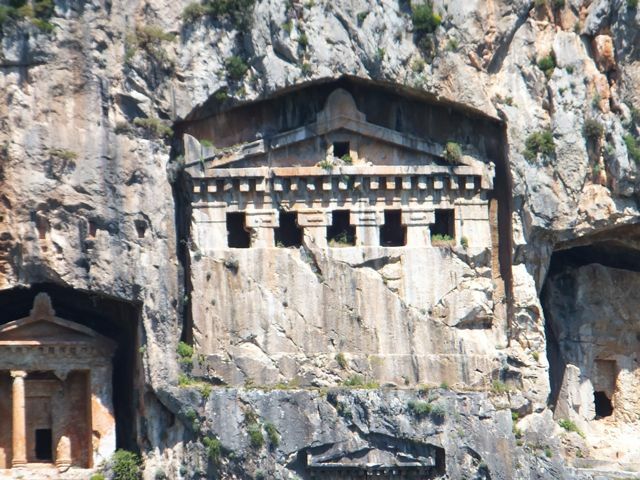 Closeup of the rock tombs near Dalyan, Turkey (Lycian tombs). Enjoying sitting in the warmth of our cockpit on Aspen. Springtime finally arrived! This is a typical dinner in Turkey. 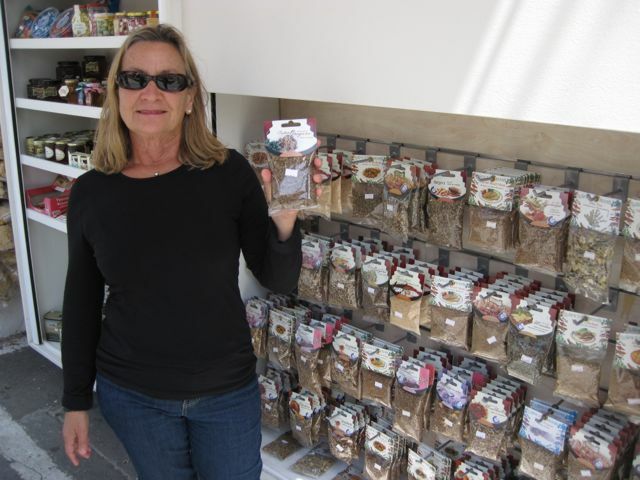 The bread is very light and airy and the salads are all so fresh! 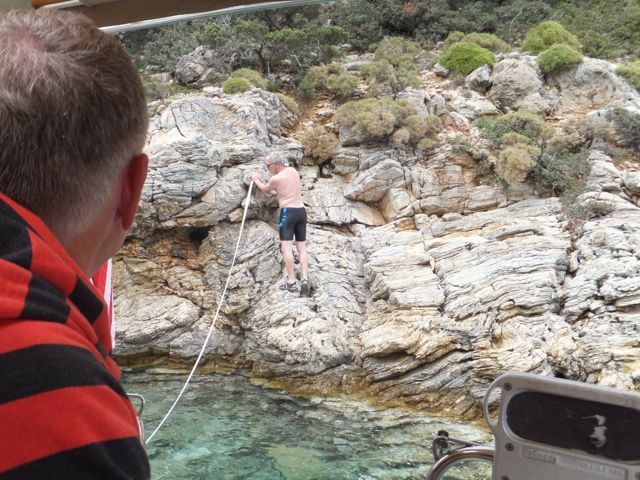 Tim scaling the rocks with our stern line. He swam to shore with the line and now has to climb up to the nice tree way above his head and attach the line there. The end result of Tim's work. 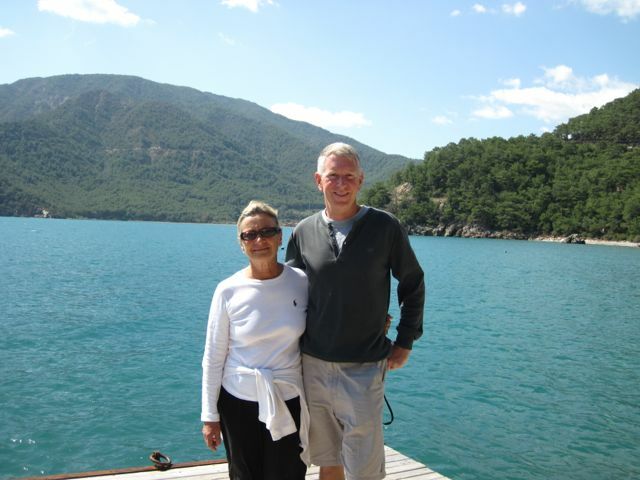 We are nice and secure to the tree and floating in the turquoise water of Turkey. 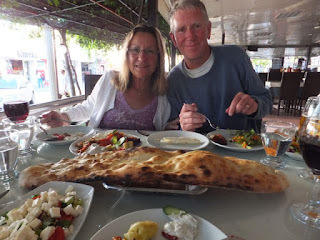 We sailed east from Marmaris (it is really south but the coast curves to the east so we call it east here) with some stops along the Turquoise Coast of Turkey. Our friends Tim and Deb joined us for this sail down the coast and next to the steep mountains that tumble into the sea. The water is spectacularly clean with a light blue color and that is why it is called the Turquoise Coast. There is very little plankton in the waters here so there is not a lot of sea life, including sea birds and fish because of this lack of nutrients. That is what gives the water the turquoise color. 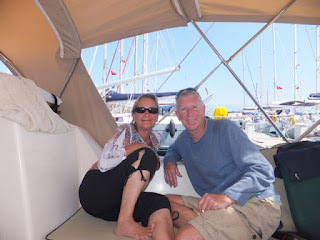 We thought that a 6 hour sail was pretty easy but we forgot that our guests are not used to the sea yet. 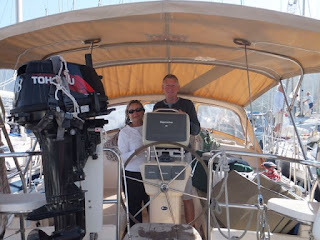 So it was kind of a long sail for them but at least the weather cooperated and we had a nice sail with the wind. 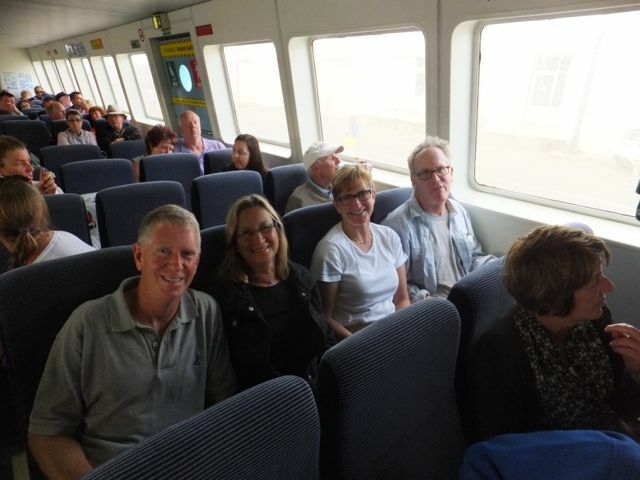 We're glad we had guests because, of course, the captain and admiral could not possibly leave the boat and that is what crew are for! 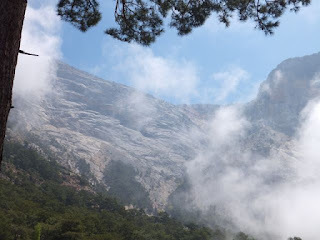 The bays are all very steep and there are not a lot of places you can even hike, unfortunately. This is the land of the Lycians who lived in this most inhospitable place. If you remember we visited near here with our car but being on the water was a very nice change. The weather is starting to warm up nicely so the nights are cool and the days are full of sunshine and warm breezes. Right now we are in a marina in Fethiye, waiting on some engine repairs. 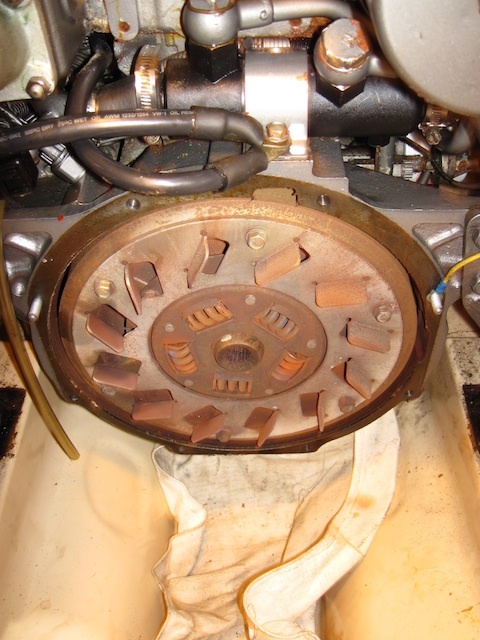 It seems that our transmission doesn't like to go into forward without a lot of coaxing so we thought it was wise to get it fixed by a professional! The new James Bond movie Skyfall is being filmed here in our marina. These James Bond movies seem to follow us around the globe. 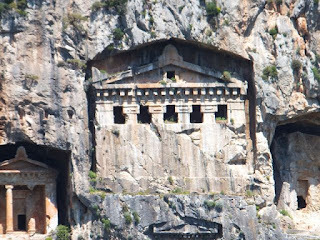 We have seen them filmed in the Bahamas, Panama and now here in Turkey. Scenes from this latest movie include a very large classic Italian sailboat that they chartered for the movie. Captain Steve was walking down the dock one evening and one of the film crew commented that they were looking for a look-alike for Daniel Craig but too bad the shooting was over for the day. 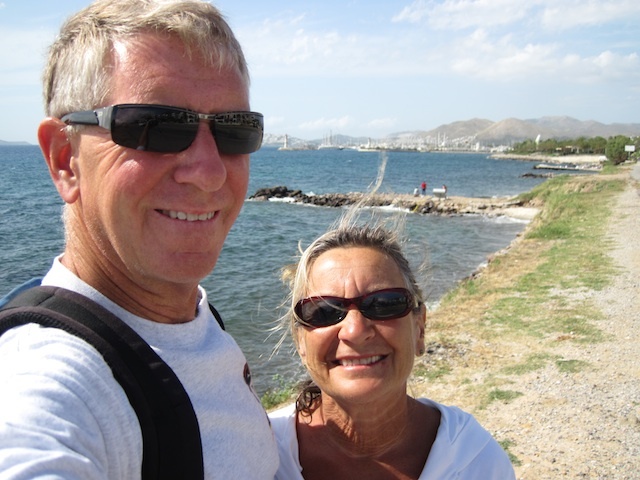 Captain Steve now has a big head, Maria thinks.